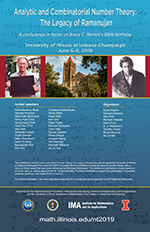 The conference Analytic and Combinatorial Number Theory: The Legacy of Ramanujan will be held at the University of Illinois at Urbana-Champaign from June 6-9, 2019. The topics for the conference include all areas of number theory, with a focus on those areas that have been influenced by Srinivasa Ramanujan. The conference will feature a broad spectrum of invited talks as well as opportunities for contributed talks. Funding is available to support the participation of graduate students, postdocs, and recent PhDs in the U.S.
Information on registration, contributed talks, funding, and travel can be found under the above links. This conference is supported by the National Science Foundation, National Security Agency, Institute for Mathematics and its Applications, and the University of Illinois Department of Mathematics and College of Liberal Arts and Sciences. For further information, contact the local organizers at nt2019@math.uiuc.edu.